First, Bordeaux is comprised of grape varietals that happen to have a high amount of phenols in their skins. These phenols are what we refer to as "tannins". These compounds definitely serve as a preservative and help give the wines a strong backbone and structure. Next, Bordeaux wines are wines with relatively high acidity. Bordeaux is similar to California's Napa Valley in many respects, but where it differs is in climactic conditions which are slightly cooler and more unpredictable. These cooler temperatures help to preserve higher acidity in the wines. Acid in wines provides an amazing lifeline to a wine. It keeps it fresh and sharp and helps the wine to maintain a balance. As wine matures if it lacks acidity it will oxidize quicker and won't be in harmony structurally. Finally, Bordeaux wineries tend to age their prized wines in new French oak barrels. The slow pre-oxidation that takes place when aging in wood also acts as a cloak of protection. The wood also imparts its own phenols and tannins to the wine as well, acting as additional preservatives. 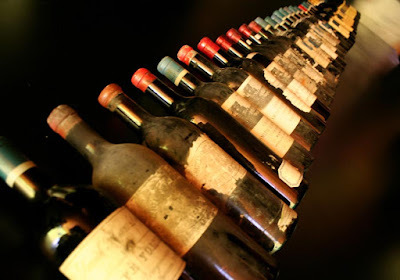 There is no doubt specific scientific language and chemistry could be laid out here to support these ideas, however these three basic principals are behind most of why Bordeaux ages so well.